It's a week until Gen Con, so it seems like we probably should have let this information out earlier. Oops. We've been pretty hard at work on a few different projects, and we want to share that information with you. So, let's dive into a few different bulletpoints. Melior Via has partnered with Studio 2 Publishing. 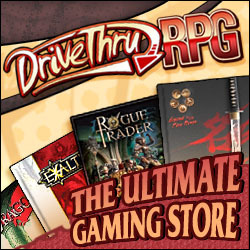 They're shepherding our print releases into retail distribution through traditional hobby games stores. Accursed was our first release through this partnership and is either now available or will be available very shortly through traditional sales channels. Accursed: Ill Omens (see below) is now available for pre-order to distributors and should be available in retail stores at the end of this month (August 2014). We'll be continuing to work with them on all future print releases, and we're very excited about having this opportunity. Morden has fallen to the Witches, but their banes continue to prey off of the mortal survivors. This book of adventures presents a variety of different challenges for Morden’s Witchmarked heroes to overcome. New foes are introduced and locations are expanded. The adventures range in scope, with some suited to a single evening’s entertainment, while others could encompass several nights of play. Any of them can be interspersed with the Plot Point Campaign included in the Accursed core book. Gen Con Ross, Jason, and I will all be at Gen Con, wearing a number of different hats. Because of that, none of us will be in one place consistently. However, John and Ross will both be visiting the Studio 2 Publishing booth (1317) fairly regularly. (Jason will be wearing his GM hat for FFG much of the time.) If you want to track us down, drop a message to info@meliorvia.com and we'll do our best to respond promptly and meet up with you. 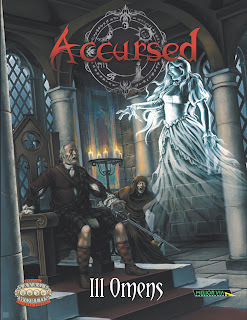 We're always happy to talk about Accursed.